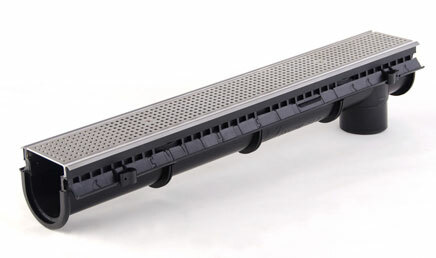 Polypropylene Stainless Steel Modular Trench Drain System - Jay R. Smith MFG Co. The Enviro-Flo® II from Jay R. Smith Mfg. Co. is a contractor-friendly trench drain system that is lightweight and easy to handle. With two mounting options and the ability to make more adjustments in the field, the Enviro-Flo II offers flexibility and ease of installation. The contractor-friendly Enviro-Flo® II trench drainage system includes exciting new features for flexible installation and adjustment in the field. The Enviro-Flo II is constructed from environmentally friendly materials that are easier to cut to make connections on the job site. New tongue & groove connections ensure a tighter, more uniform joint. The new frame features integral clips for rebar installation. The Enviro-Flo II features a new accessory rail that allows for separate attachments, such as bottom or side outlets, to be added. A recycled board insert for protection during the pour comes standard with the Enviro-Flo II. 1 Meter (3.28') 100% Polypropylene Post Industrial Recycled Material with U.V. Inhibitors. Channel of Interlocking Design with a Built-inSlope of 0.6% with Radiused Bottom.